COSMETOLOGY CLASSES STARTING APRIL 15th & MAY 6th, 2019. This program of study is designed to provide the students with the skills to beautify hair through shampooing, hair styling, hair shaping, hair coloring, permanent waving, and hair relaxing. This also includes beautifying of the skin, hands and feet. SPANISH & ENGLISH CLASSES AVAILABLE, WEEKLY PAYMENT PLAN OPTIONS, FLEXIBLE HOURS, COMPETITIVE PRICES, GOOD PLACEMENT RATES, VISA PROCESSING FOR I20. Dreaming about tomorrow does not bring tomorrow to you. Taking steps towards a better future is what makes those dreams a reality. At QM Career Institute we focus on you, your goals and your career. It is our mission to graduate competent workers to take on the jobs our students wish to pursue and that our community is in need of. All of these will help reinforce and enhance educational concepts and career skills needed to develop competent and well prepared professionals within each field of training offered at QM Career Institute. To educate students in the medical field using various new techniques throughout the industry. To educate students to be successful through personal motivation with the understanding of the financial aspects of the medical industry. To master the necessary skills and procedures required for students to successfully pass the State Board examination and obtain their license and, ultimately, become a productive part of our society. Thank you for visiting QM CAREER INSTITUTE. 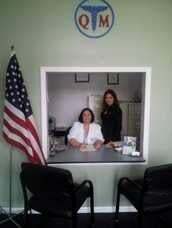 QM Career Institute, has provided educational services for our community in the area of health and beauty since 2008. The Commission for Independent Education from the Florida Department of Education. Additional information regarding this institution may be obtained by contacting the Commission at 325 West Gaines Street, Suite 1414, Tallahassee, FL 32399-0400. Toll-Free telephone number 888-224-6684. Please call us at (561) 305-2635. This legislation requires each licensed institution to inform students and employees at orientation and on its website of the existence of the Florida Department of Law Enforcement (FDLE) sexual predator and sexual offender registry website and toll free telephone number.